London-based duo Dentaku have made digital instruments out of beer bottles, text messages, and color-sensing robots. But, for their latest trick, Yuri Suzuki and Mark McKeague want to let you make music. Meet Ototo, a tiny synthesizer that lets you make almost anything—from oranges to origami—into an instrument. Ototo means little brother in Japanese, and the name fits. This cassette-sized synthesizer is designed for people who don't know how to program or code—a kind of "starter's guide" to electronic music. 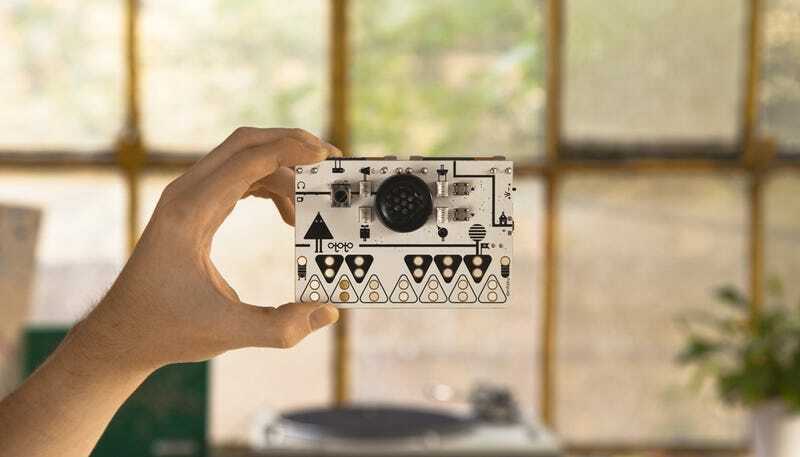 On a printed circuit board the size of a cassette tape, this little square of plastic packs a speaker, a headphone jack, four sensors, and most importantly, 12 inputs—the little triangular tabs—that you can trigger notes using your fingers or crocodile-clip wires. Gizmodo got in touch with Dentaku to find out what they've watched people make so far. "We wanted to leave the possibilities of what people could do with Ototo to be as broad as possible," Mark McKeague explained to us over email. "What we've found is that people quickly move to using extra materials and sensors and just experiment with different combinations to create their own sound interactions." McKeague's counterpart, sound artist Yuri Suzuki, has posted experiments like a windmill sequencer and a clementine-based drum machine on Instagram, revealing just a few of the seemingly limitless options for turning all of the objects in the world around you into electronic instruments, with infinite unreleased albums hidden in plain sight. So where can you buy a couple of these little guys? That was our question, too. The duo are hoping to launch a pre-order soon, so keep your eyes peeled on their website.